A common, inexpensive drug that is used to prevent heart attacks and lower blood pressure may also help melanoma patients live longer. Researchers at Penn State found that melanoma patients who received immunotherapy while taking a specific type of beta blocker lived longer than patients who received immunotherapy alone. In a follow-up experiment with mice, the researchers saw the same results. Todd Schell, professor of microbiology and immunology at Penn State College of Medicine, said that because beta blockers are already widely available, the findings – published in the journal OncoImmunology – could indicate a simple way for physicians to better treat their patients. Patients with metastatic melanoma, or melanoma that has spread to other parts of the body, often have a poor prognosis, and while some forms of immunotherapy – treatments that boost the body’s immune system to fight disease – are promising, response rates are less than 35 percent. Previous research has shown that physiological stress prevents the immune system from fighting tumors effectively, while lower stress boosts the benefits of anti-cancer treatments. The researchers were curious about whether lowering stress with beta blockers would improve outcomes in patients treated with immunotherapies. In studies developed by Dr. Kathleen Kokolus, a postdoctoral fellow, the researchers analyzed data from 195 metastatic melanoma patients who were treated with immunotherapy between 2000 and 2015, 62 of which were also taking beta blockers. They compared survival between the patients taking beta one-selective blockers, pan beta blockers and no beta blockers. 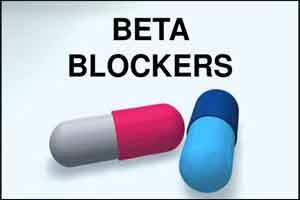 While there was little difference in how long patients taking beta one-selective blockers or no beta blockers lived, the results indicate that patients taking pan beta blockers lived significantly longer than the others. Five years after immunotherapy, about 70 percent of patients receiving pan beta blockers were still alive, versus about 25 percent of those taking beta one-selective blockers or no beta blockers at all. To help explain the results, the team performed a parallel experiment in mice with melanoma. They treated the mice with immunotherapy and with or without the pan beta blocker propranolol. The researchers found that the propranolol significantly delayed tumor growth and increased survival when combined with immunotherapy. Dr. Joseph Drabick, professor of medicine, said the results suggest that reducing physiological stress with beta-blockers can help improve the effectiveness of immunotherapy and survival for melanoma patients. Drabick also said the study was a good example of the benefits of finding new uses for drugs that have been around awhile. Schell said that in the future, they’ll be working on a clinical trial to further explore and understand the role of beta-blockers in treating cancer. Ying Zhang, PhD candidate; Dr. Jeffrey Sivik, adult oncology clinical pharmacy specialist; Carla Schmeck, nurse practitioner; Dr. Junjia Zhu, assistant professor of biostatistics and bioinformatics; and Dr. Elizabeth Repasky, professor of oncology at Roswell Park Cancer Institute, also worked on this research. This project was partially supported by the Pennsylvania Department of Health Cure funds and the National Institutes of Health.